Old people can develop osteoarthritis when the cartilage wears away at a joint, leaving no cushion between two bones. The arthritis that kids get is very different – it’s actually an attack by the immune system and has nothing to do with the degeneration of cartilage. The number of new cases of children diagnosed annually with arthritis is quite low. Depending on the country doing the reporting, incidence is only 1-22 cases per 100,000 children. This means that most doctors are not going to diagnose a new case of juvenile arthritis – it just doesn’t show up that often. there are different types of juvenile arthritis. The least common type of juvenile arthritis is enthesitis, characterized by inflammation where tendons attach to the bone. It is most commonly seen in boys aged 9-15, and is easily dismissed as growing pains. This disease often affects large joints such as hips, shoulders, and knees; spinal involvement occurs later in the disease. Enthesitis Related Arthritis can also include spondyloarthropathy, ankylosing spondylitis and irritable bowel disease. Redness and swelling do not necessarily accompany the joint pain of ERA. 27% of ERA patients have uveitis, so eye exams are important. Juvenile psoriatic arthritis can occur in children who do not have psoriasis. This presents a challenge for the diagnostician, because skin involvement can take years to develop. The arthritis is not necessarily symmetrical, and lab work will show a negative rheumatoid factor. Systemic JIA was formerly called Stills Disease. The typical SJIA patient is a young anemic child, either boy or girl, with a high fever and a rash. Labs show elevated CRP, ESR, white count, and platelet count. Diagnosis can be difficult because joint involvement does not necessarily occur at the same time as the initial fever and rash. The remission rate is 60%-87%. Seropositive polyarticular JIA (blood test for rheumatoid factor is positive) usually affects adolescent girls. Joint involvement is symmetric. This disease is very similar to adult rheumatoid arthritis. Seronegative polyarticular JIA (blood test for rheumatoid factor is negative) usually affects young girls and has a better prognosis than those who are RF+. 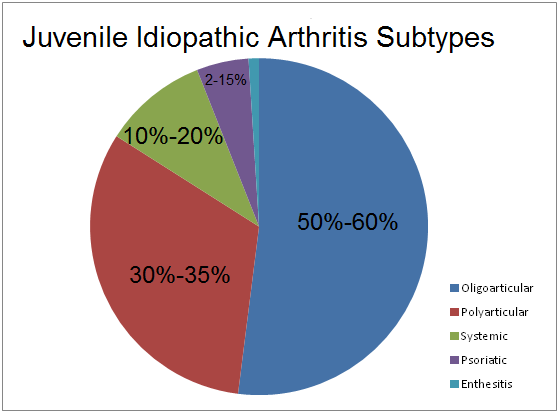 The most common type of juvenile idiopathic arthritis is oligoarticular. Children with oligoarticular JIA are always RF negative, but about 70% have a positive ANA. This type of JIA affects fewer than five joints during the first six months of disease. Textbook presentation is little girls age 1-4, with a swollen (not necessarily painful) knee or ankle. After six months, if there are still fewer than five joints affected, the diagnosis is persistent oligoarticular JIA; this group of patients has a 75% remission rate. If additional (5 or more) joints are affected after six months, the diagnosis is extended oligoarticular JIA; this group of patients has a 12% remission rate. It is important to check the eyes of kids with oligoarticular JIA, because asymptomatic uveitis is a significant risk. Kids who complain of joint pain need to be followed diligently until a diagnosis is reached.